Welcome to Barkman & Smith Physical Therapy's in Bedford and Irving patient resource about Carpal Tunnel Syndrome. Carpal tunnel syndrome (CTS) is a common problem affecting the hand and wrist. Symptoms begin when the median nerve gets squeezed inside the carpal tunnel of the wrist, a medical condition known as nerve entrapment. Any condition that decreases the size of the carpal tunnel or enlarges the tissues inside the tunnel can produce the symptoms of CTS. 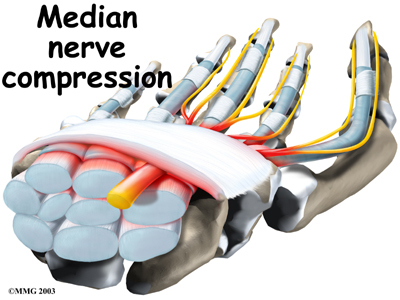 The median nerve passes through the carpal tunnel into the hand. It gives sensation to the thumb, index finger, long finger, and half of the ring finger. It also sends a nerve branch to control the thenar muscles of the thumb. 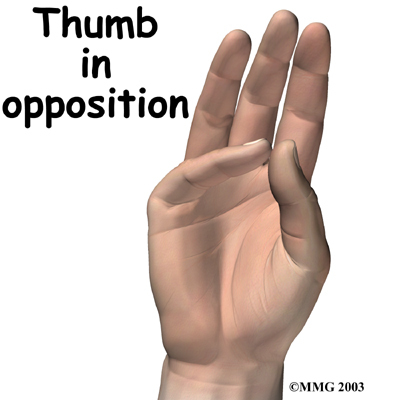 The thenar muscles help move the thumb and let you touch the pad of the thumb to the tips each of each finger on the same hand, a motion called opposition. 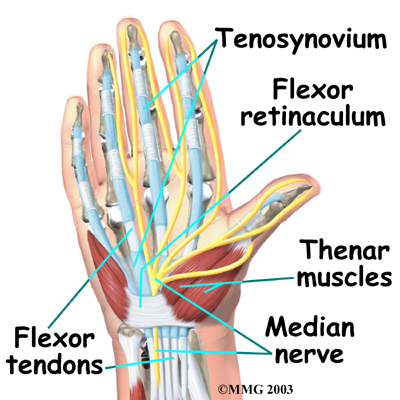 The median nerve and flexor tendons pass through the carpel tunnel. 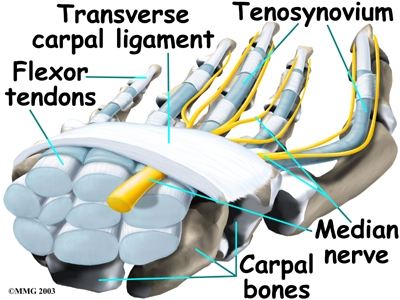 The median nerve rests on top of the tendons, just below the transverse carpal ligament. The flexor tendons are important because they allow movement of the fingers, thumb, and hand, such as when grasping. The tendons are covered by a material called tenosynovium. The tenosynovium is a slippery covering that allows the tendons to glide next to each other as they are worked. Any condition that makes the area inside the carpal tunnel smaller or increases the size of the tissues within the tunnel can lead to symptoms of CTS. For example, a traumatic wrist injury may cause swelling and extra pressure within the carpal tunnel. The area inside the tunnel can also be reduced after a wrist fracture or dislocation if the bone pushes into the tunnel. Any condition that causes abnormal pressure in the tunnel can produce symptoms of CTS. Various types of arthritis can cause swelling and pressure in the carpal tunnel. Fractured wrist bones may later cause CTS if the healed fragments result in abnormal irritation on the flexor tendons. Other conditions in the body can produce symptoms of CTS. Pregnancy can cause fluid to be retained, leading to extra pressure in the carpal tunnel. Diabetics may report symptoms of CTS, which may be from a problem in the nerve (called neuropathy) or from actual pressure on the median nerve. People with low thyroid function (called hypothyroidism) are more prone to problems of CTS. In other instances, CTS can start when the tenosynovium thickens from irritation or inflammation. 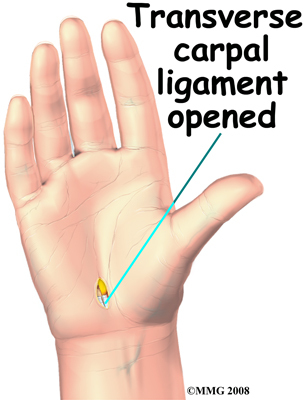 This thickening causes pressure to build inside the carpal tunnel. 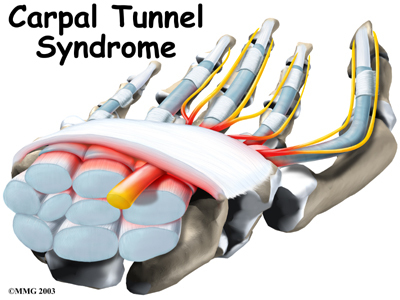 But the tunnel can't stretch any larger in response to the added swelling, so the median nerve starts to squeeze against the transverse carpal ligament. If the pressure continues to build up, the nerve is eventually unable to function normally. When pressure builds on the median nerve, the blood supply to the outer covering of the nerve slows down and may even be cut off. The medical term for this is ischemia. At first, only the outside covering of the nerve is affected. But if the pressure keeps building up, the inside of the nerve will start to become thickened. New cells (called fibroblasts) form within the nerve and create scar tissue. This is thought to produce the feelings of pain and numbness in the hand. If pressure is taken off right away, the symptoms will go away quickly. Pressure that isn't eased right away can slow or even stop the chances for recovery. 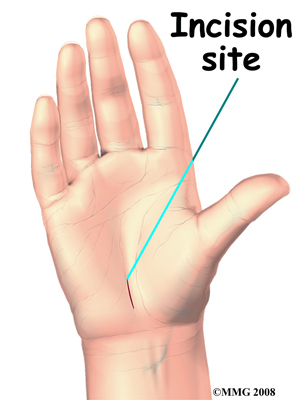 One of the first symptoms of CTS is gradual tingling and numbness in the areas supplied by the median nerve. 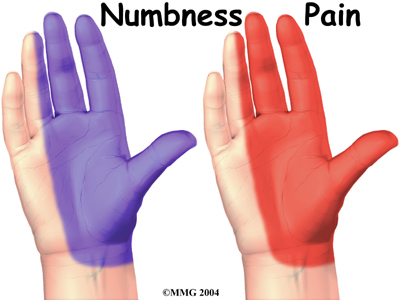 This is typically followed by dull, vague pain where the nerve gives sensation in the hand. The hand may begin to feel like it's asleep, especially in the early morning hours after a night's rest. Sometimes pain may even spread up the arm to the shoulder. If the condition progresses, the thenar muscles of the thumb can weaken, causing the hand to be clumsy when picking up a glass or cup. 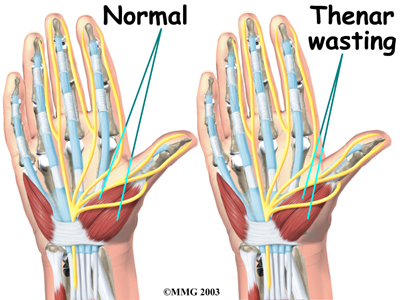 If the pressure keeps building in the carpal tunnel, the thenar muscles may begin to shrink (atrophy). When you visit Barkman & Smith Physical Therapy, our Physical Therapist in Bedford and Irving begins the evaluation by obtaining a history of the problem, followed by a thorough physical examination. Your description of the symptoms and the physical examination are the most important parts in the diagnosis of CTS. Commonly, patients will complain first of waking in the middle of the night with pain and a feeling that the whole hand is asleep. Careful investigation usually shows that the little finger is unaffected. This can be a key piece of information to make the diagnosis. If you awaken with your hand asleep, pinch your little finger to see if it is numb also, and be sure to tell our Physical Therapist if it is or isn't. Other complaints include numbness while using the hand for gripping activities, such as sweeping, hammering, or driving. When you begin your Physical Therapy in Bedford and Irving, our Physical Therapist will recommend that you change or stop the activities that are causing your symptoms if at all possible. Avoid repetitive hand motions, heavy grasping, holding onto vibrating tools, and positioning or working with your wrist bent down and out. If you smoke, talk to your doctor about ways to help you quit. Lose weight if you are overweight. Reduce your caffeine intake. Our Physical Therapist will often have you wear a wrist brace. This sometimes decreases the symptoms in the early stages of CTS. 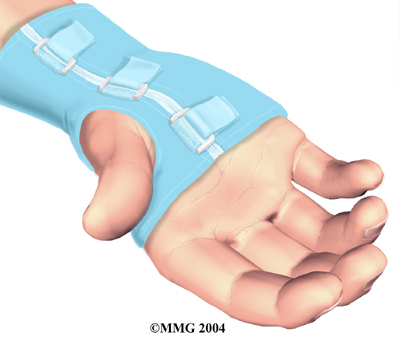 A brace keeps the wrist in a resting position, not bent back or bent down too far. When the wrist is in this position, the carpal tunnel is as big as it can be, so the nerve has as much room as possible inside the carpal tunnel. A brace can be especially helpful for easing the numbness and pain felt at night because it can keep your hand from curling under as you sleep. The wrist brace can also be worn during the day to calm symptoms and rest the tissues in the carpal tunnel. The main focus of our treatment is to reduce or eliminate the cause of pressure in the carpal tunnel. Our Physical Therapist may check your workstation and the way you do your work tasks. We may provide suggestions about the use of healthy body alignment and wrist positions, helpful exercises, and tips on how to prevent future problems. Our Physical Therapist may also begin treatments to reduce inflammation and to encourage normal gliding of the tendons and median nerve within the carpal tunnel. Although time required for recovery is different for every patient, as a general rule, you may see improvement in four to six weeks. We may ask you to continue wearing your wrist splint at night to control symptoms and keep your wrist from curling under as you sleep. Try to do your activities using healthy body and wrist alignment. Limit activities that require repeated motions, heavy grasping, and vibration in the hand. When the stitches are removed, you may begin your Physical Therapist program. Our treatments are used at first to ease pain and inflammation. Our Physical Therapist may apply gentle massage to the incision to help reduce sensitivity in and around the incision and limit scar tissue from building up. We will show you some special exercises that you can do to encourage normal gliding of the tendons and median nerve within the carpal tunnel. As you progress, our therapist will give you exercises to help strengthen and stabilize the muscles and joints in the hand, wrist, and arm. We use other exercises to improve fine motor control and dexterity of the hand. Our Physical Therapist will also work with you to help you do your daily and work activities safely and with the least amount of strain on your wrist and hand. When your recovery is well under way, regular visits to Barkman & Smith Physical Therapy will end. Although we will continue to be a resource, you will eventually be in charge of doing your exercises as part of an ongoing home program. If your symptoms started after a traumatic wrist injury, your doctor may order X-rays to check for a fractured bone. If more information is needed to make the diagnosis, electrical studies of the nerves in the wrist may be requested by your doctor. 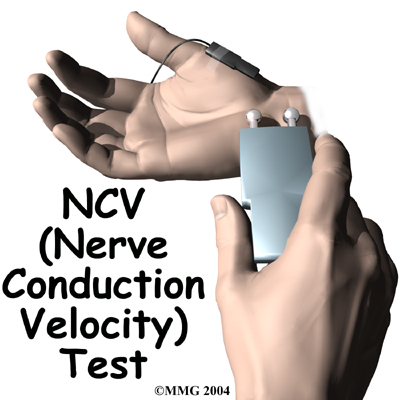 Several tests are available to see how well the median nerve is functioning, including nerve conduction velocity (NCV) test. This test measures how fast nerve impulses move through the nerve. Anti-inflammatory medications may also help control the swelling and reduce symptoms of CTS. Ensure that you consult with your doctor or pharmacist regarding the use of pain relief or anti-inflammatory medication. These include common over-the-counter medications such as ibuprofen and aspirin. Oral steroid medication may also offer some relief. In some studies, high doses of vitamin B-6 have been shown to help in decreasing CTS symptoms. Some types of exercises have also shown to help prevent or at least control the symptoms of CTS. 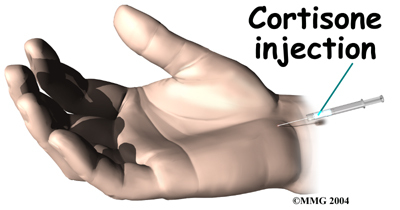 A cortisone injection may help ease symptoms and can aid your doctor in making a diagnosis. If you don't get even temporary relief from the injection, it could indicate that some other problem is causing your symptoms. 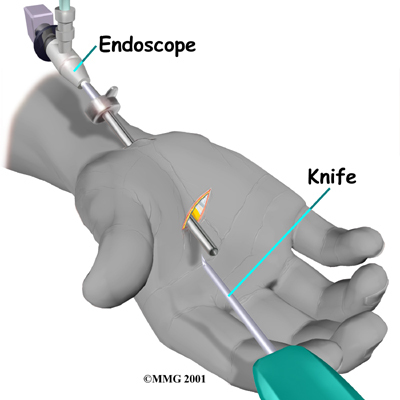 When your symptoms do go away after the injection, it's likely they are coming from a problem within the carpal tunnel. 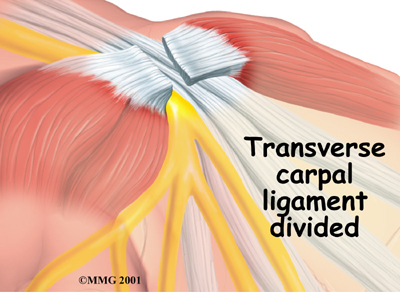 Some doctors feel this is a signal that a surgical release of the transverse carpal ligament would have a positive result.